To prepare the dish we made a rich but quickly assembled broth and then added orecchiette (small ear-shaped pasta), fresh peas, snow peas, and chopped bibb lettuce to the simmering liquid. The brodo was garnished with crispy bits of pancetta, fresh mint, and a sprinkling of Parmigiano Reggiano. 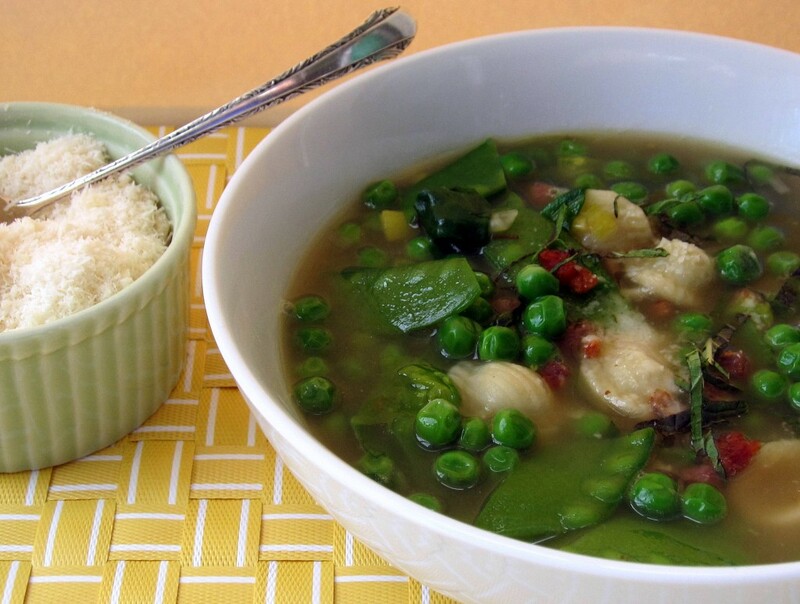 From our first sips, we all adorned this soup with its spring accents. It is light in taste, yet totally satisfying, and it bursts with the verdant hues of the vegetables. Another bonus is that it takes only about 45 minutes to prepare. Best of all, here is a soup that both young and older cooks will find easy to make this spring. 1. In a large, heavy pot set over medium heat, heat the olive oil until hot and add the pancetta. Cook, stirring, until the pieces are golden and crisp, 3 to 4 minutes. Remove with a slotted spoon and drain on paper towels. Add the leeks, and sauté, stirring, until softened, 2 to 3 minutes. Lower the heat if the leeks begin to brown. 2. Add the stock and bring the soup to a simmer. Then add the pasta, and cook 8 minutes. Next, add the snow peas and fresh peas, and cook until both are just tender and the pasta is al dente, 3 to 4 minutes. Stir in the chopped lettuce and cook 1 minute more. Season the soup with salt to taste. Market note: Orecchiette, which in Italian translates as “little ears,” are available in many supermarkets. If you can’t find them, substitute small macaroni or small farfalle. 1. Place the stock, celery, carrots, onions, parsley and thyme sprigs in a large, heavy saucepan or pot (with a lid) set over medium heat. Bring the mixture to a simmer, lower the heat, cover, and cook at a simmer 30 minutes. Cooking Tip: If you are stressed for time and can’t make this quick stock, then use a good quality purchased stock, such as Swanson’s Chicken Stock, which works well in a pinch. This entry was posted in Food News and tagged brodo, mint, pancetta, peas, soup, Spring by brosbottom. Bookmark the permalink. This sounds like the perfect lunch soup for my husband on his heart healthy diet after heart surgery. We have eaten so much fish and chicken over the last 10 years but genetics wins out. I will prepare the soup broth without the onions for my Low Fodmap diet so it might not be quite as good but good health has to prevail. Flavorful meals at our house is a challenge. I love your recipes and books. If need be, I can often adapt them to my dietary needs and know that they will be wonderful. Thanks for many great meals at our house. Thank you so much, Sarah, for such a nice note. I love knowing that readers enjoy the recipes on my blog. I think the soup will be fine without the onions. If you can try to use fresh peas which add great color and a bit of texture to the dish!